When trying to formulate a stay at home schedule you have to factor in kids and all the craziness of life. 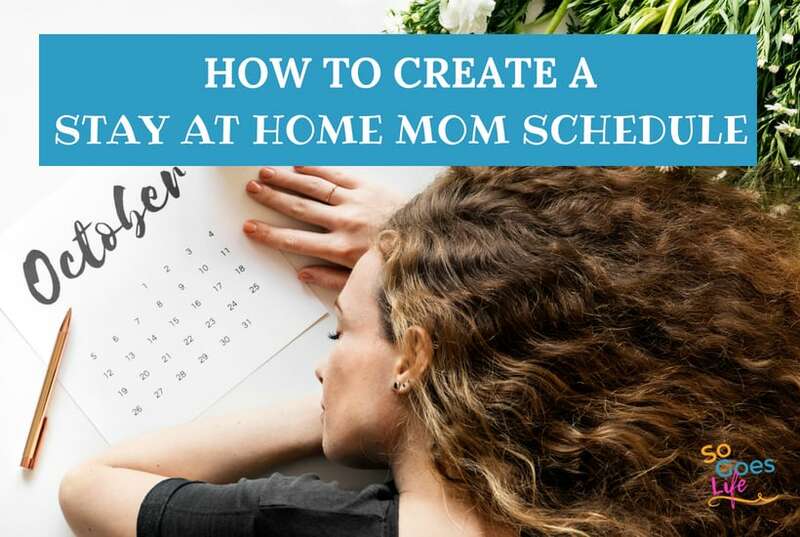 Most of the blog posts I read on this subject give you a detailed list of how the mom has structured her schedule right down to the times and days. Scheduling like that just doesn’t seem to work in my world, so I’m going to share how to create a schedule that will actually work with a husband, kids and life. You can’t start a schedule unless you know what your priorities are. Before you even try and create a schedule take 10-15 minutes and write down all the things that you need to accomplish in a week. This includes household chores, kids lessons, school projects, nap times, extracurricular stuff, time with your spouse, one on one time with your kids, personal time for yourself. You get the idea, there are a lot of factors to consider. Once you have written out your list, prioritize the things that need to happen each day. Depending on your stage, this could be school, naps, food . . . . the list goes on and on. Right now, my number one priority is to make sure my daughter always gets a nap. I literally plan everything I do around her nap schedule. I’m sure all of you can understand my reasoning – happy baby and happy mother who gets a break. When I was raising my older kids and they were teenagers, I felt like my life revolved around school events and chauffeuring them around. Either stage had its own issues. The goal at this point is to schedule the daily necessary stuff in your life. The stuff that has to happen daily regardless of other events in your life. Once you have the necessary daily mom stuff planned it is easier to work in the small details of day to day life. On a side note, one of the best things I did was take active steps to simplify my life. I hate dealing with household chores and they are typically the last thing I schedule as a mom. However, they have to get done. I work part-time, so I have to pay close attention to my daily schedule or my time as a stay at home mom gets completely taken over by household chores. This is one of the reasons I work so hard to develop a stay at home mom schedule. I want to make sure and optimize my time with my baby. Because I do work part-time and my schedule shifts periodically I’ve struggled to do specific chores on specific days. What I’ve done instead, is create a quick list of the tasks that need to be done daily and weekly. If I’m working I do a scaled down version of my daily task list. On the days that I’m home, I spend more time on my daily tasks and then begin working my way through my weekly task list. I try and front load as many of the tasks as possible so I’m not stuck doing chores like the laundry and grocery shopping on the weekend. I’m also constantly looking for ways to streamline my regular chores. I’m started using the 5 Dollar Meal plans which have been life-changing and also ordering my groceries for pick-up through Walmart. It is a free service, but if you sign up through my Walmart Referral link, you’ll get $10 off your first order and I’ll get $10 off my next order. One of the biggest shifts to stay at home mom life for me was the realization that I still needed help from my husband for certain tasks. I personally believe that even if you are home 100% of the time, the working spouse still has responsibilities in the home. I don’t think my husband has ever mopped the floors in our home, but he has done a ton of laundry, lots and lots of cooking and he always takes care of the trash. More importantly, I know that if I ask him to help with random tasks he’ll help. Often as a stay at home mom, we feel like we should be able to do it all in the home. It isn’t going to happen and there is nothing wrong with asking for help. I discovered I needed this the hard way. I kept pushing myself to do more, I wasn’t getting enough sleep and ended up with a mild case of postpartum depression. Postpartum depression is seriously scary and can hit at pretty random times. Keep in mind too that you don’t need to be a new mother to experience depression and anxiety. One of the best ways to keep yourself mentally sane (which is the best thing you can do for your kids), is to make sure that you incorporate small pockets of time for yourself into your schedule. For me, I prioritize my sleep. If I don’t get enough sleep I’m significantly more prone to depression and anxiety. Exercise is a close second. Personally, I feel that all mothers need to devote at least a little bit of time to sleep and exercise. If you are struggling to exercise, I’ve been using these 20-minute workout videos that I absolutely love. Other people’s triggers may be different. Either way, find something that helps you relax or just something that you do just for you. I know it sounds odd, but this blog is my release valve. I love writing and helping people and have found that when I’m actively working on my blog I’m a significantly happier person (particularly now that I make money blogging). My blog gives me a purpose beyond myself and my kids. Find something that gives you that little bit of extra purpose and I can guarantee that you’ll be happier. So after that little ramble, the point is that you need to prioritize little pockets of time for yourself. I know that during certain phases of childhood going to the bathroom is a group activity (I’m in that phase right now). Stay at home Moms often don’t get much free time, which means you have to find little pockets of time for yourself. Look through your weekly schedule and be creative. I get up 10-15 minutes earlier than my daughter. This gives me a little bit of time to take care of myself and get myself energized to face the day. During my carpool days, I tried to optimize my waiting time by reading. It sounds insignificant, but taking those little moments for yourself in your mom daily schedule will make you happier and healthier. I also take a few minutes to myself when my daughter is eating. I’m sitting right there with her, but it is one of the rare times when I partially check out. The goal is to lose the #momguilt and realize it is okay to schedule time for yourself when putting together your stay at home mom schedule. This is still very much a work in process for me, but I’ve discovered that when I take a few minutes to write my to-do list for the next day my stay at home schedule flows so much better. This simple task helps me to remember what I need to do and then prioritize my day. It is really fulfilling to look back after a crazy day and realize that you actually did manage to accomplish a few things. I rarely accomplish my tasks as effectively on the days when I skip the to-do list. Creating a stay at home mom schedule that works is really hard. As a parent, your whole life revolves around your child and it just gets more crazy as they age. When my older kids were teenagers, my life was driving. Now with a new baby in the home, my life revolves around nap time. I’ve learned that when I’m flexible and realistic my schedule actually works. Ironically enough it is when I try and stay rigid that my schedule blows up in my face. 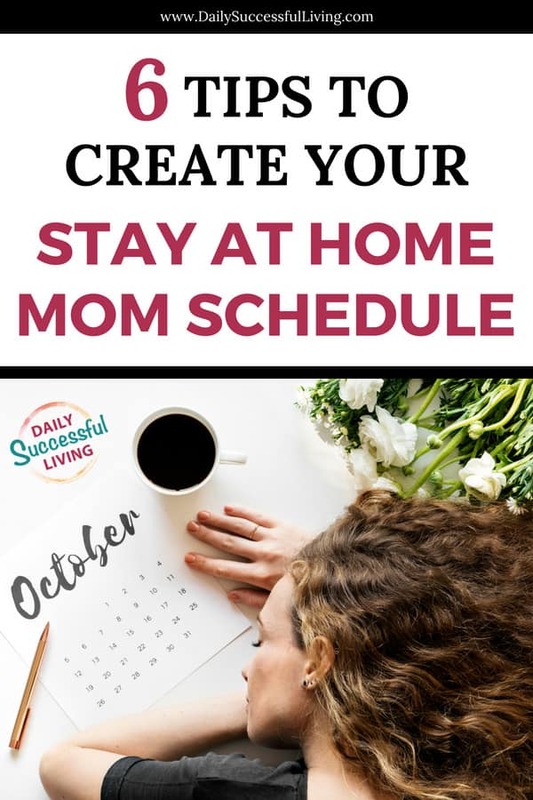 Just be honest with yourself and your time constraints and you’ll have a much easier time creating a stay at home mom schedule that works for you and your children. Being a stay at home mom is hard. I always assumed it would be easier than working, boy was I wrong. They both have their unique challenges, but the level of responsibility that comes with parenthood can be completely overwhelming at times. I’m always questioning myself and wondering if I’m doing enough. 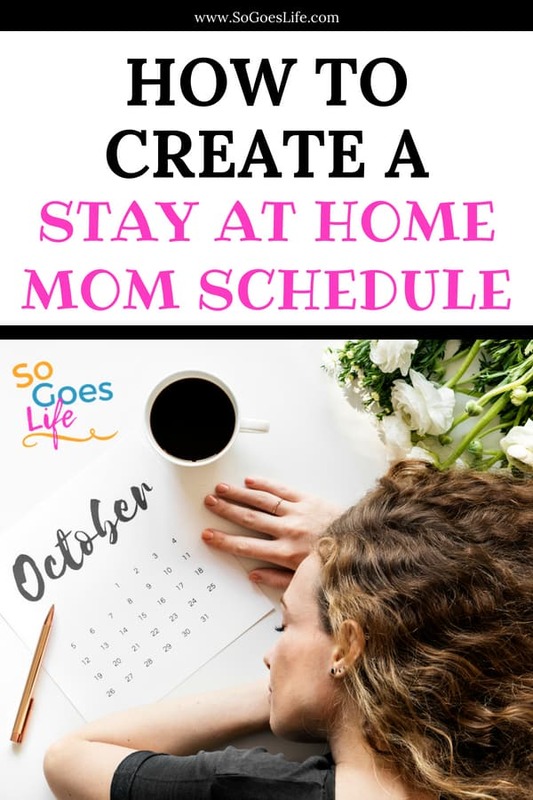 What I’ve discovered is that when I take the time to create and follow a stay at home mom schedule my life is so much more organized and easy to manage. Having a daily mom schedule gives me goals and direction that I often miss when I’m lost in disorganized land. Even if you only have a few minutes, take some time to set some new priorities in your life and use them as the basis of your new stay at home mom schedule. You won’t regret it!